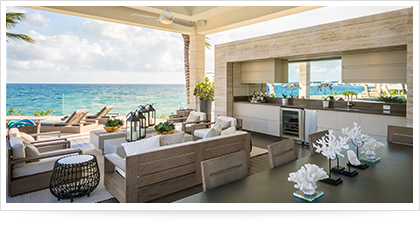 The heart of the Barefoot Elegance villa is its premium oceanfront location. 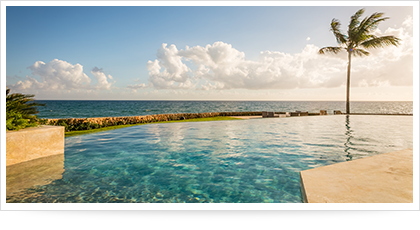 Enveloping the property with its refreshing serenity, the crystal-clear Caribbean Sea comes to life with uninterrupted views and access. 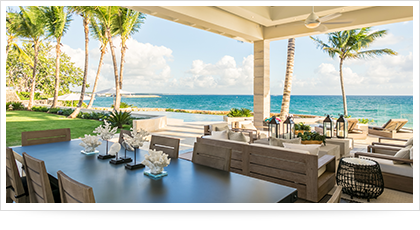 With multiple seating areas and a staircase down to the ocean, the expansive outdoor property embraces the coastline with airy lounging areas that make for the ultimate experience. At Barefoot Elegance you will laze in luxury. Go ahead—take a dip in your private, 60-foot-long infinity-edge saltwater pool. Rest poolside while sipping fresh, homemade cocktails and juices procured from delicious local ingredients. Doze the day away under the cool and breezy lanai while relishing the lush green lawns, blowing palm trees, and other tropical accents. Nighttime provides the ideal opportunity to seize the enchanting beauty Barefoot Elegance has to offer. Gather around the oceanfront wood-burning fire pit and dine under the stars along the water’s edge while tickling your senses with sumptuous foods prepared just for you and your guests. From morning until night, the Barefoot Elegance experience is truly one of unmatched beauty, serenity and leisure. Dive in…the water is divine! Savor delectable homemade treats and front-row ocean views. Take it all in…and then take a nap.